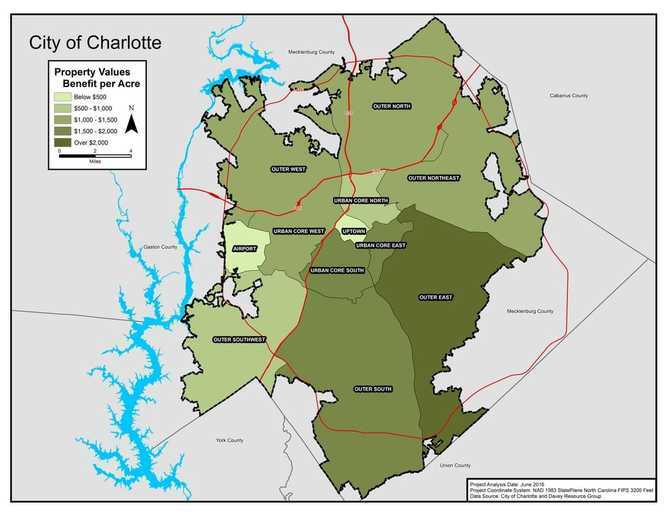 Charlotte's trees increase property values. ​Trees increase residential property and commercial rental values by an average of 7% (Wolf 2007). This is beneficial to both property owner and city budget bottom lines. Property values increase and properties sell faster when communities become more desirable places to live. Charlotte is home to many families, young professionals, and individuals from all walks of life. In order to continue to attract residents to the Charlotte area, the community needs to invest in its property. "Our trees are important to our curb appeal." "Outsiders always comment about how green it is here. Makes it very attractive to people considering moving here!" "Driving down the tree lined streets in Charlotte is one of my favorite reasons for living here"
Charlotte's trees provide a boost to property values of over $286 million.